Search DIY mold removal on the internet (you probably already have! )—what do you see? Likely, you will find an article after article suggesting different ways in which to rid your home of mold all by yourself—no professional assistance required. You might find tips about mold removal with bleach or DIY mold removal for less—but, mold cleanup is not that simple. Here, we’ll tell you how to know if mold is a problem and why mold removal is not a do-it-yourself project. How Do You Know If Your Denver Home Has a Mold Problem? How do you know if you have a mold problem? Well, large mold infestations can usually be seen or smelled. But, individuals with allergies or breathing conditions may be more susceptible to mold infections or reactions. If you see or smell black mold (among other types) you need to get assistance fast. Seeing mold is a sign that you have a serious problem. How can mold be prevented before it’s seen? 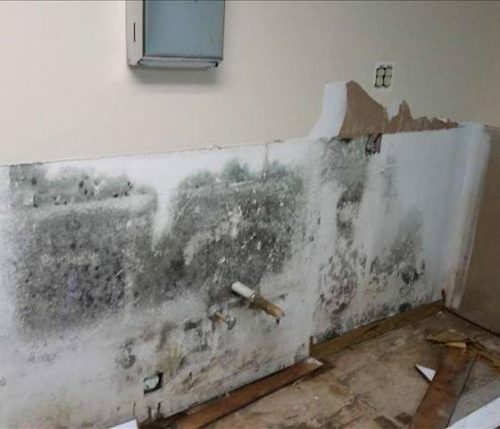 Be aware of the conditions that can cause mold—like water leaks, condensation, infiltration, or flooding—and correct them ASAP to prevent mold from growing. Mold removal, in any form, can be dangerous for your health and the health of your family—here are 4 reasons why you should avoid DIY mold removal and call in the professionals. Mold is a tricky thing. You might think you’ve rid yourself of the problem when you can’t see it anymore—but that’s only half of it. If you don’t know where to look for mold, you might miss a spot and not properly assess your property’s damage. Improper mold removal techniques might not get rid of the mold for good. Often, DIYers are not trained in professional mold removal—and they don’t know to look for problem areas not easily seen. To ensure the mold is gone for good, it’s best to bring in the professionals to clean and inspect the space for repeat offenders. How many times have you decided to DIY only to spend money and still not fix the problem? Mold removal is one of those projects that require special supplies and lots of time. If you don’t knock out the problem on the first try, that’s money down the drain. Then you’re stuck having to hire a professional anyway. From the onset of mold, it’s best to address the problem immediately by contacting a mold removal specialist ASAP. In addition to the monetary expenses, you also put your health at risk when you try to remove mold yourself. Some may not experience the immediate effects of mold exposure—but some do. Exposure to damp and moldy environments can cause a variety of health effects, especially in people that are sensitive to molds. Many experience nasal stuffiness, throat irritation, coughing, wheezing, eye irritation, and, in some cases, skin irritation. At 970 Services, we understand disaster. Our team is always professional, attentive, and willing to go the distance for any and all of our clients in Northern Colorado. If you are ever faced with a mold problem, leak, flood, or natural disaster, remember to call a local, trusted home restoration company (like us!) first. Need assistance ASAP? Give us a call now at (970) 888-0970 or contact us online for a free estimate. Located in Loveland, CO, we also offer home restoration service in the following areas: Fort Collins, Loveland, Ault, Greeley, Denver, Windsor, Boulder, Longmont, and throughout Northern Colorado.